A Mig 23 did a victory roll over Ganfouda today as the Libyan National Army declared it had liberated the last part of the Benghazi district from terrorist control. Though in fact a last group of militants had retreated the some high rise apartment blocks, according to one army source, this was no longer a battle, it was a siege of a few buildings. Jubilant troops celebrated in streets that only 48 hours ago would have been death traps. The army source claimed that the terrorists had taken a dozen hostages with them into their last position. However, it was unclear if these people were being used in some sort of attempted negotiation. One of the hostages is reportedly a senior LNA commander captured last year and another a cousin of Muammar Qaddafi. It is not known if the emir of the Tunisian franchise of Ansar Al-Sharia, Saifullah Ben Hussein known as “Abu Ayaz” and apparently trapped in Ganfouda, is among the surviving terrorists. The LNA has given no details of enemy casualties. In the course of the day at least 60 women and children were either discovered in abandoned buildings or surrendered themselves voluntarily to LNA troops. Amnesty International and Human Rights Watch, backed by UNSMIL chief Martin Kobler last year expressed deep concern at the fate of the civilians trapped in the last terrorist-controlled areas. Though there is strong evidence that civilians have been killed and wounded in LNA air strikes and bombardments, the feared slaughter does not appear to have taken place. LNA commanders several times explained that their lack of progress came about because of concern for civilian casualties. The LNA’s triumph today was tempered by the death of yet another senior officer. Othman Al-Motrady commander of 298 Tank Brigade was killed in a land mine explosion in Ganfouda. The brigade’s earlier commander brigadier Naji Al-Moghrab was seriously injured last November when the LNA began its final assault of the terrorist positions in the southern part of Benghazi. For almost two years, armed forces commander-in-chief Khalifa Hafter has repeatedly predicted the imminent defeat of the insurgent Benghazi Revolutionaries’ Shoura Council and its terrorist allies from IS and Ansar Al-Sharia. It did not come about. He was accused of deliberately drawing out the anti-terrorist operation in order to underline the need for the LNA to counter terrorism and bring stability to the east of the country. It now seems clear that the turning point came in May 2015 when the LNA managed to take the small port of Mreisa to the south of the city. This had been the main supply point for the militants with vessels running back and forth from Misrata. Though the LNA claimed to have destroyed at least one of these supply craft in an air strike, until Mreisa was actually overrun the terrorists were able to bring in reinforcements and weapons while evacuating their wounded. However even when this proper port was lost to them, the militants demonstrated considerable resource by continuing to supply their forces in Garayounis, Gwarsha and Ganfouda across the beach at the Ganfouda resort. 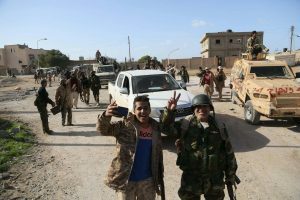 Similar supply success was achieved by the terrorists for their downtown enclaves of Sabri and Suq Al-Hout despite the presence of LNA ground and naval forces supposedly in control of the waters around Benghazi port. Tonight, as the final mopping up operations continued in Ganfouda, the LNA’s attention has shifted, as expected, to Sabri. Terrorist positions were today staffed by helicopter gunships. The concentration of tanks around the area has reportedly been joined by more ground troops. A military sourced indicated that the plan was to attack the remain terrorist enclaves while they were still despondent at their final defeat in Ganfouda.